(Nanowerk News) A simple but realistic problem in nuclear physics, such as the computation of the deuteron’s binding energy, can be solved via quantum computing on existing quantum devices (Physical Review Letters, "Cloud quantum computing of an atomic nucleus"). 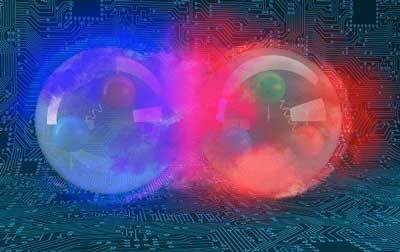 Scientists simulated an atomic nucleus using a quantum computer. The results demonstrate that quantum systems can solve nuclear physics problems that explain how the building blocks of our universe work. The quantum computing of the lightest atomic nucleus is the first step toward scalable computations of heavier nuclei on quantum processor units. The computation via cloud access also opens the field of quantum computing to a large group of scientists. Quantum computers promise to solve “exponentially hard” problems, such as computing the structure of molecules, atoms, or atomic nuclei. A collaboration of nuclear physicists and quantum information scientists at Oak Ridge National Laboratory reported on the first quantum computation of the deuteron, the lightest atomic nucleus, using publicly available software and accessing quantum processors via the cloud. To accomplish this feat, they employed a simple-yet-realistic model for the deuteron and tailored the calculation to the constraints imposed by cloud computing on noisy quantum chips. The quantum computation yielded the deuteron’s binding energy to within a few percent of precision, making this the first step toward scalable nuclear structure computation on quantum processor units.